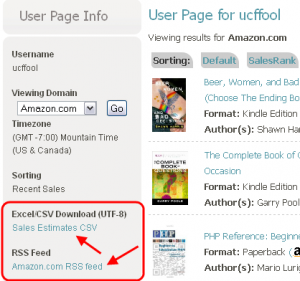 NovelRank User Pages now have two new features: RSS Feeds for book sales and CSV/Excel download of monthly sales estimates! These are both long requested features, so they are now available on the left side. If you don’t have a user page yet, create your own user page by logging in through your favorite 3rd party website. You will be prompted to setup your user page if this is your first time logging in through that service. Both new features will include every book present on your user page in a single download/RSS. In both cases, the download is for the currently viewed Amazon domain (.com, .co.uk, .de, etc). Switching the domain will switch the links for the download/RSS to the new domain automatically. The RSS feed has one additional new benefit: Timezone aware! That’s right: Sale times are now adjusted for your account’s timezone, and the timezone is specified within the RSS feed. My little thank you to all the folks in Germany and the UK who use NovelRank! Remember, if you are using a modern browser, such as Firefox or Chrome, you can also access the RSS feed from the URL/Address bar. Of course, you can also subscribe to the blog this way… The below image is from Firefox. Enjoy the new features, and I hope your 2011 is starting off with lots of sales! This entry was posted in News and tagged csv, rss, user pages on January 19, 2011 by Mario Lurig.